On Monday May 7, The New School for Jazz and Contemporary Music will host the first concert in a new collaboration with the world-renowned downtown performance venue, Joe’s Pub at the Public Theater. Consistent with at Joe’s Pub’s reputation as a premier showcase for up-and-coming musicians and emerging artists from a variety of disciplines, each semester the New School for Jazz and Contemporary Music will be presenting performances by selected student ensembles, providing its talented young musicians with real-world professional experience playing in one of New York’s finest music rooms. 7:00 p.m. The Rhythm & Blues Revue: Michael Wolff, jazz pianist, composer, producer, actor, and New School Jazz faculty member, will lead a big band performance of timeless music by Sly Stone, Raphael Saadiq, D’Angelo, Frankie Beverly & MAZE, James Brown and more. 9:30 p.m. The New School Afro-Cuban Jazz Orchestra: Bobby Sanabria, drummer, percussionist, composer, bandleader, and New School Jazz faculty member, will lead a performance of Latin Jazz of the East Harlem tradition, which was created by the Cuban maestro Mario Bauz√°, and features blazing brass and driving percussion. *The Fine Print: If your seat is located at a dining table there is a $12 food minimum per person. 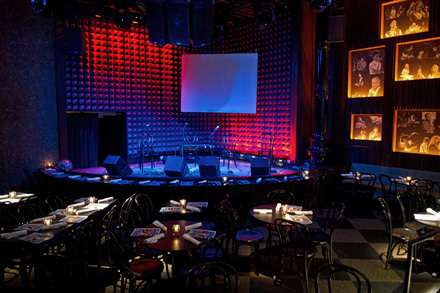 Joe’s Pub seating is communal, which means you may have other guests at your table. If you are located at a counter, bar stool or standing, there is a $12 food minimum or two drink minimum. Once purchased, tickets are non-refundable.